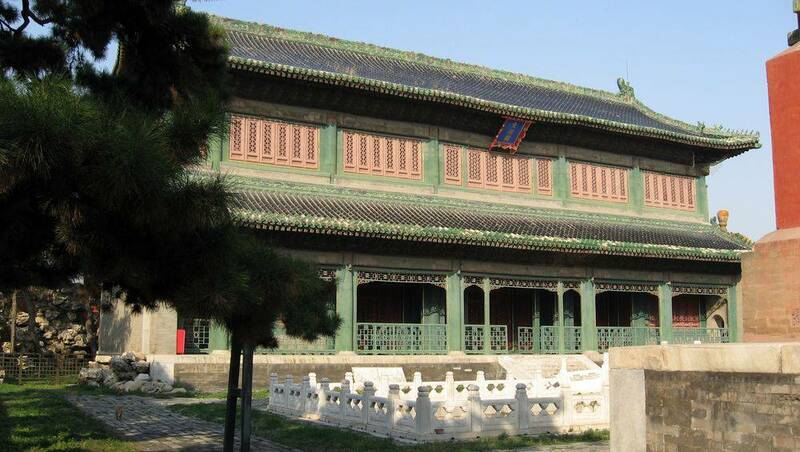 The eastern outbuildings correspond to the southeastern area of the Forbidden City. This is a relatively large area compared to others. It has a very low density of pavilions and is characterized essentially by the presence of the palace of literary glory. This is not insignificant in that in the general map of the Forbidden City the right side is rather devoted to what is spiritual, literary, artistic, while the left is military. This area contains several pavilions but the main one is by far the pavilion of literary glory. The others are more anecdotal, although interesting, architecturally speaking. Note that this area contains pavilions that can not be visited, these are offices, the headquarters, etc. 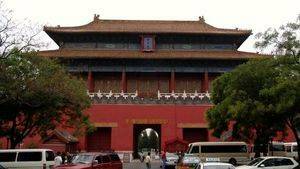 Built in 1420, it is the eastern gateway to the Forbidden City and echoes the Gate of Western Flowering (Xihuamen). Both share the same structure, rectangular in shape. 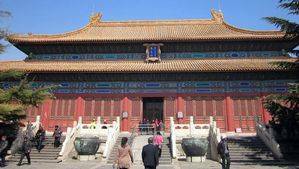 With its red platform, the door rests on a white marble base in a Buddhist style, building in which are pierced the three vaulted passages. On the platform is the square tower and its double roof surrounded by white marble columns. The tower is 5 arches wide and 3 deep with the offices around. 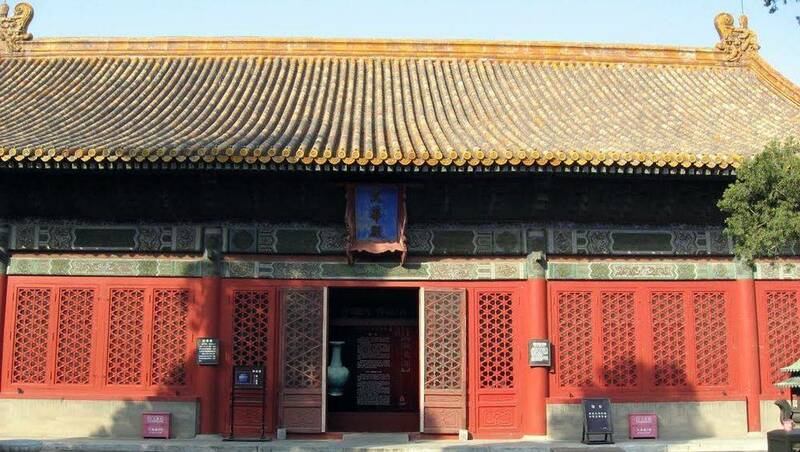 The stele under the eaves bears the name of the door, written in Chinese "Donghuamen". 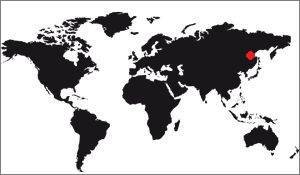 Initially it was in three languages ​​(Manchu, Mongolian and Chinese), then later Mongol was removed. Finally, the 1919 revolution will only retain Chinese. 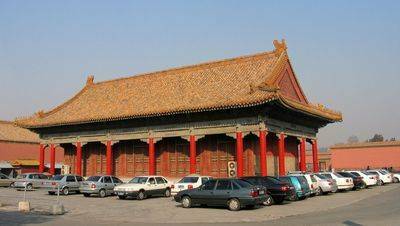 Since 1758, the 23rd year of Emperor Qianlong's reign (1736-1795), the tower has been used to store the military clothes that were worn during parades. 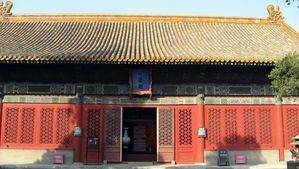 At the beginning of the Qing Dynasty, only cabinet officials were allowed to pass through this door, whereas in the middle of the Qianlong reign, the senior and middle-aged ministers had this privilege. 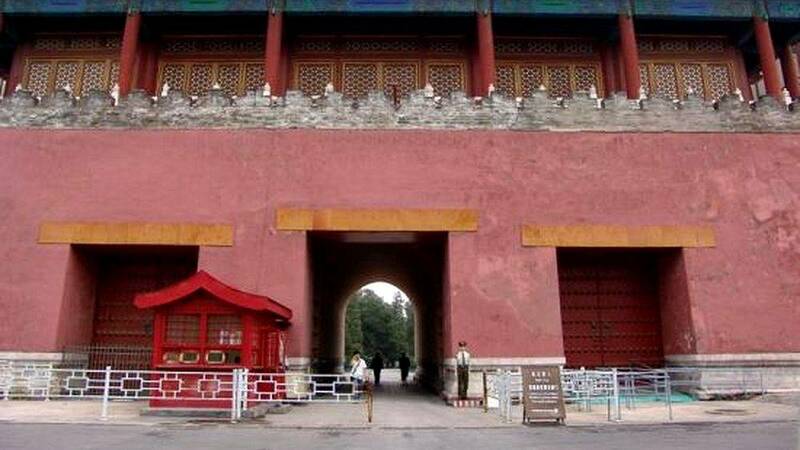 The coffins of the Qing emperors, empresses and regents were also allowed to pass, hence the name "Guimen" (the ghost gate). The door has 8 nails rather than the 9 of the other doors, it is due to the fact that the 9 is the figure of the Emperor and 8 that of the ghostly things. The hall of the observation of sincerity and esteem is in the complex of the pavilion of literary glory. It is a rather simple pavilion, a large rectangular monolith painted like the others in red with a very imposing roof. The belvedere of literary depth is in the complex of the pavilion of literary glory. It is above all a library located behind the pavilion of literary brilliance. It was built in 1776 during the 41st year of the reign of Qianlong (1736-1795) to replicate the famous Paradise Lookout (Tianyi Ge) located in Zhejiang Province. This two-story pavilion is covered with black ceramic tile and green tile roof. These colors make the pavilion solemn and elegant. This choice of colors was not trivial: The black was associated with water, it was hoped to protect the belvedere of fire. 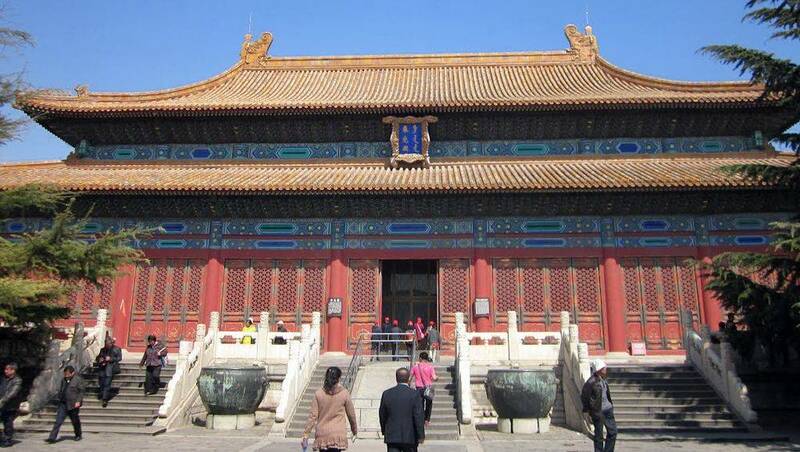 The books in the belvedere included the complete Library of the Four Treasury Bills and the Collection of Ancient and Modern Books Approved by the Emperor. Since the reign of Qianlong (1736-1795), apart from the emperor, officials and major secretaries have also been allowed to consult the books preserved here. 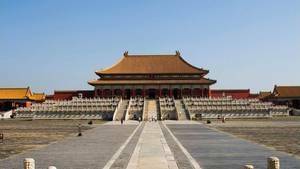 The archery of the forbidden city is in the west, in the eastern annexes. 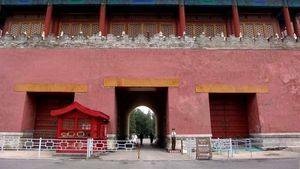 The Gate of the Ancestor Cult leads, as its name suggests, to the ancestor worship pavilion. This complex is in the eastern outbuildings. The door of literary glory leads, as its name suggests, to the pavilion of literary glory. This complex is in the eastern outbuildings and consists of a large monolithic building with wood-framed walls. It is on a rather high terrace.